Get to know the Swiss-Fil hunk who's an international racer and the face of the newest gizmo built for speed--just like him. 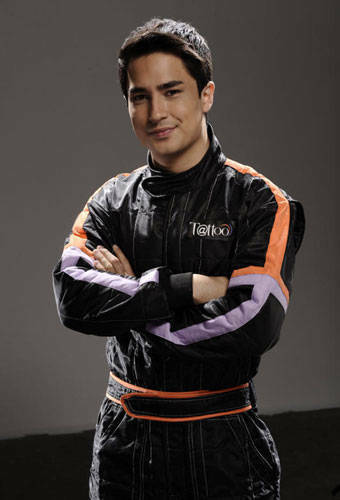 As you know, this month we're featuring hunks who play all kinds of sports, even motorsports, here in Cosmo. So, we really wanted you to meet 20-year-old Swiss-Filipino hottie Marlon Alexander Stockinger, who is fast making a name for himself (and the Philippines!) on the Formula One Circuit. In case you didn't know, Formula One is the highest class of single seater auto racing, and Formula One cars are the fastest circuit-racing cars in the world! There's nothing like a hot guy who drives a hot car. Just like Manny Pacquiao in boxing and Phil and James Younghusband along with the rest of the Azkals in football, Marlon is the first Filipino to win in this renowned international-scale tournament. And he's another hottie who successfully got us interested in a new sport. With tons of other racing achievements under his belt, it's no wonder Globe chose this swoon-worthy icon of speed to be the face of their new Tattoo Tonino Lamborghini Stick. It's a broadband USB that "quenches every web surfer's thirst for speed, running at up to 10 mbps, in a sleek and sophisticated design." In case you're hoping to see Marlon in showbiz, don't hold your breath just yet, because he's focused on his racing career right now. Marlon knew since he was very young (at age 9, to be precise) that racing is his passion. Born and raised in the Philippines, Marlon moved to Switzerland when he was 17 to pursue his racing dreams. Though he started out in karting, Marlon eventually gravitated toward Formula cars. He even emerged as champion in his first professional race, and continues to rank in Formula One competitions. He also became the first scholar for BMW Pacific in 2008. "All the sacrifices I have made to pursue my passion has led to this make-or-break point, and there's no turning back," shares Marlon. "And now, more than ever, the next few races will not just be about me. Beyond fulfilling my dream, I also want to show the world that Filipinos can stand out and make their mark in the international racing arena." Launch the gallery to see more of this Swiss-Fil hottie looking sleek in his racing attire and sophisticated in a suit and tie. Globe introduces the new Tattoo Tonino Lamborghini, in collaboration with a renowned name in the auto industry. Race to the nearest Globe store now to grab it, or call 730-1000 for more details. You can also see more of Marlon in his personal website.